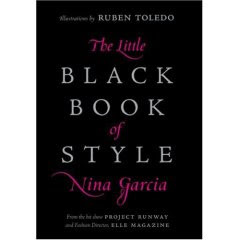 Anita lent me The Little Black Book of Style by Nina Garcia. The book is awesome, and I recommend it to anyone who needs a little help revamping his or her closet. The book is full of great advice on how to make your close full of clothes that not only look great but fit you perfectly. My favourite part of the book was where Garcia interviewed designers for tips. What made this section great was that she asked questions related to the designers’ actual fields of expertise. It’s an interviewing technique that seems like common sense but isn’t followed by many people. She asks Missoni about prints, and Elle MacPherson about undergarments. Makes sense, doesn’t it? This book can still be found in the Lifestyle/Fashion section of your local bookstore so have a look. It’s an instant classic.